It’s funny when you’re really torn on your thoughts about something, how the end rating of it can be rather difficult. That’s where I sit with Thor, Marvel‘s first movie spectacular of 2011. There’s so much to like and at the same time, so much to dislike. From wasted characters to what’s a real long origin story, whose heart is rushed, to amazing visuals, some pretty decent acting and easter eggs for the comic books die hards. There’s a lot here that can get me to go either way. The movie is an origin film. The majority focuses on Thor’s banishment to Earth and his learning of humility. That’s pretty much it. There’s some plotting and some interesting action scenes, but really, it’s Thor on Earth, talking and complaining. That’s not necessarily a bad thing. 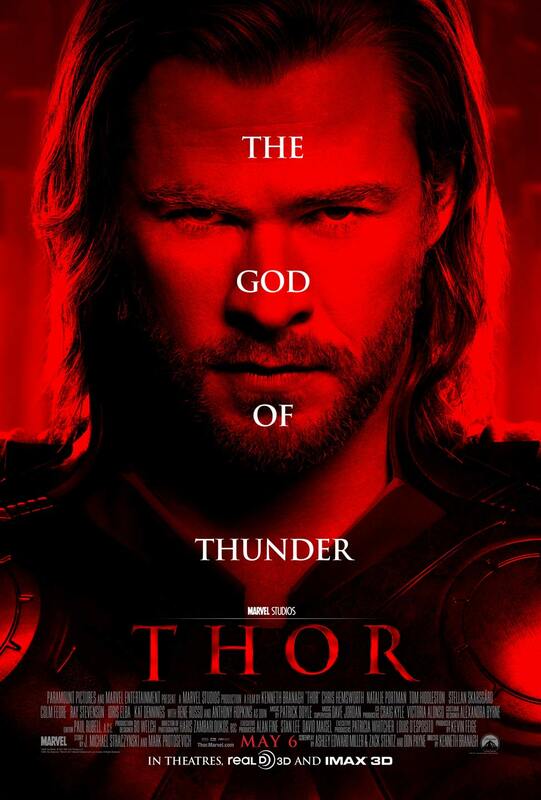 Chris Hemsworth as the title character does quite a good job. He just feels like Odin’s son and plays brash and arrogance well. You do see some growth, though his break through comes off as rushed and too short of a time. Tom Hiddleston as Loki also stands out though the character doesn’t come off as scheming as I’d expect (for the God of mischief, he does very little). The supporting cast is varied Anthony Hopkins as Odin is amazing, just a force of acting nature that’s perfect for the role. Natalie Portman is decent as Thor’s love interest, but isn’t given much to do. Similarly Stellan Skarsgård, Kat Dennings (who I have a massive crush on), Rene Russo, Idris Elba, Ray Stevenson, Tadanobu Asano (why does he have that accent? ), Josh Dallas and Jaimie Alexander all are there, but the movie might haver been the same without them or not as well known actors in some of those roles. Dennings and Portman aren’t the strong female characters they should have been, instead falling for Thor on looks alone and belittling the character. Clark Gregg as S.H.I.E.L.D. Agent Coulson is always entertaining and here he’s given a beefier role than previous Marvel movies. The biggest difference is the structure of the movie. Spider-Man, Iron Man and Hulk dealt with the origin of the character for a short while, Thor on the other hand, it’s the entire movie. The second part is infinitesimal compared to the previous movie’s story structure. My other gripe is the special effects. It’s very difficult to make this movie have that same realism of Spider-Man or Iron Man, but many of the special effects come off as the quality you would have seen in the original Superman movies. The green screen is replaced with CGI in this case. Those effects though do make Asgard stand out as the beautiful, rich world we’d expect, full of awe and wonder. But, when it came to the overall effects, it made me wanting. There’s tons of small moments for the comic book fans and much is set up for next year’s Avengers and even this year’s Captain America: The First Avenger. Enough was present I’d need a second viewing to catch it all. I wasn’t blown away by the movie, but it was good. It’s definitely a film to see in the theater and especially in 3D which added a richness and depth some of the scenes needed. Overall though, there was a certain magic missing from this. That magic that made me think a person could crawl up buildings, build a super suit or most importantly a man could fly. Direction: Kenneth Branagh was perfect for the movie. There’s a Shakespearean quality to Thor and as an actor and director, that’s something Branagh knows well. There’s also a surprising amount a small touches. A tear here or there that one might not catch, but adds so much to a scene or performance. There was also a tough balancing act of the Asgardian gods hamming it up versus showing their larger than life personas. It’s a movie that could of easily gone either way in quality and Branagh I think pulled it off. His weakest point was the action scenes, which as happens all to often, turns into a kinetic blur, difficult to tell what’s occurring. Acting: The acting was all over the place. Hemsworth, Hiddleston, Hopkins and Gregg all stand out. Hopkins especially had a gravitas that added to the film. Everyone else was good and entertaining but nothing that blew me away. The Dark Knight has shown that comic book movies don’t have to expense acting for action or entertainment, the bar has been set high for everyone. Plot: The movie has a very different structure than previous Marvel films, the origin is the movie as opposed to part of it. It changes up the plot structure from what we’ve experienced already. The film is about Thor showing humility, a eureka moment that is spent far too little time on. He goes from brash to humble in very little time, instead of a slow growth. Overall, the story is entertaining, the pacing is about right and there’s a lot of build up for future Marvel movies to come. 3D: I saw the film in 3D and while it didn’t add an amazing amount like some films, I think it did add a depth to some scenes that made them grander. This is definitely a pay the extra buck for it, but don’t go crazy and pay five. Overall: The movie didn’t blow me away like I hoped. There was definitely a bit of magic that was missing but it’s a solid film. Definitely worthy to kick off the summer movie season. It’s a film you need to see on the big screen and for the comic book fans out there, there’s much to keep you on your toes. And as always, stay for the credits.